How a Walking Foot Helps Sewing Accuracy? Do Sewing Machines Come with a Walking Foot? If you’ve just stepped into the world of sewing, you might have come across different sewing machine accessories that will all look new to you. One such accessory is a walking foot. 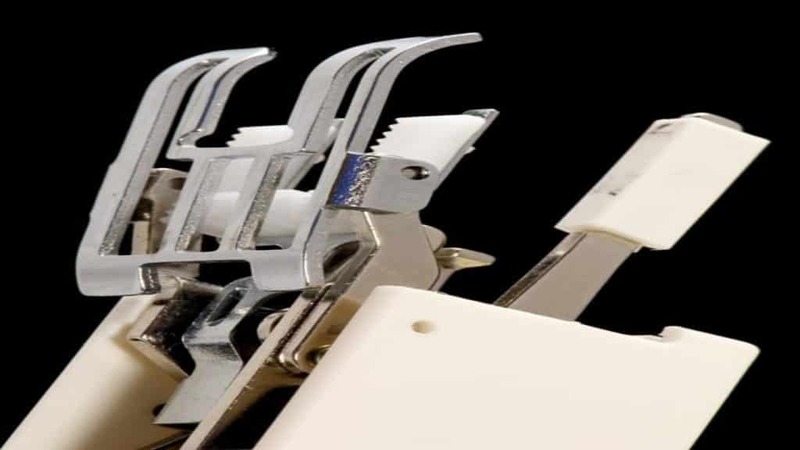 A walking foot or an even feed foot is a unique sewing machine presser foot designed to make quilting work a breeze. A sewing machine that comes with a walking foot as an accessory may be called a walking foot sewing machine. If you need to do quilting work and other complicated tasks, you should get a walking foot sewing machine. We will explain what a walking foot is and how to use a walking foot sewing machine to help you make the most of this special accessory. So, let’s get started. A walking foot is a sewing machine accessory with built-in feed dogs for guiding multiple layers of fabric through a sewing machine. This foot evenly feeds the batting, backing, and quilt top through a sewing machine. It can also be used for quilting gentle curves. The gripping action of the feed dogs in the walking foot works in conjunction with the feed dogs of the machine. This synchronized action lets all layers of the sewing or quilting project to move through the sewing machine at a uniform pace without shifting away from one another. A walking foot may be used anytime, but it is especially handy for quilting when you are working with projects where several layers of fabric are involved or when you are sewing together different fabrics that may shift away from one another while passing under the sewing machine’s presser foot. 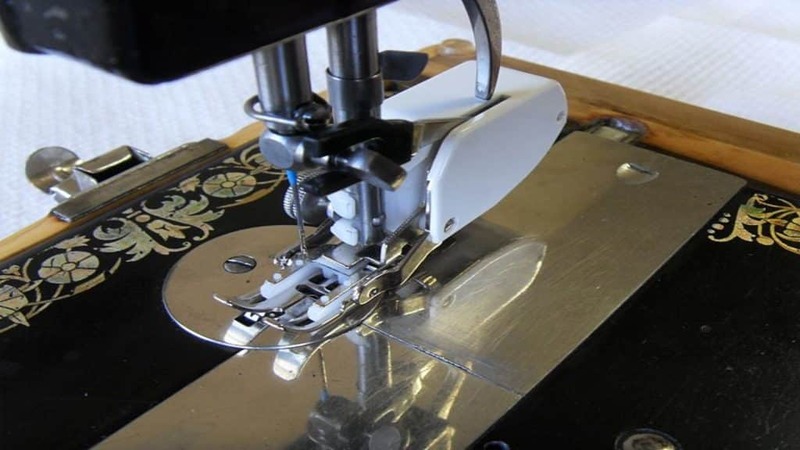 When you are attaching a walking foot accessory to your sewing machine, you must position the movable bar of the walking foot in such a way that it rests on top of the machine’s needle bar. When the needle of the move will move up and down, the teeth of the walking foot will move in sync with the feed dogs of the machine underneath the fabric. Regular presser foot of a machine presses down on fabric and slides along the top. This means that it sometimes pushes against the fabric as feed dogs are moving the fabric towards the back. A walking foot corrects this by making sure that the top layer of the fabric passes through at the same pace as the bottom layer of the fabric so there is no misalignment. A walking foot is a great accessory for you if you want to do straight line quilting as it keeps all the layers together while preventing the top layer of the fabric from getting ahead of the bottom and middle layers. This prevents tiny pleats and puckering from occurring when the direction of quilting lines is changed. So, whenever you are doing straight line quilting, use a walking foot. Extra teeth in the walking foot help it climb over bulky seams. For example, where a waistband of a skirt meets its side seams or where the fly of pants meets its crotch seams. If you use a regular presser in these tricky places, it may get stuck creating a nest of thread beneath the machine. A walking foot grips the fabric which allows it to easily move uphill. This is why it is good for stitching heavier fabrics. If you are completing a clothing project and have to sew a garment with separate cuffs or a waist seam, then you should match the seam intersections to create a vertical or horizontal line that looks pleasing. Even if you do everything right, a regular presser foot might scoot the fabric’s top layer forward while you are sewing. If that happens, you will end up misaligning seam lines on your garment. The difference will look unsightly. It can be extremely frustrating to unpick a small section of the stitching to fix a tiny blunder such as this. If you use a walking foot, you would be able to achieve the perfect seam interaction on your first try. If you pin the seams securely, you will be able to sew the layers evenly. If you frequently sew, you might sometimes notice strange drag lines within the button placket or hem after you successfully topstitch it down. Sometimes the fabric settles from a blast of hot steam but occasionally the problem persists. When you fold a layer of fabric under and topstitch it, a regular presser foot may scoot the top layer of the fabric at a high speed than that bottom layer. A walking foot keeps all the layers even so that you get flat edges. With a walking foot, you can sew garments that have a directional print and must be matched properly across major seams. You will have to cut your pieces and pin them properly before they can be sewn right with the help of a walking foot. Knit fabrics have a stretchy nature. Because of this, they tend to grow under the regular presser foot while you are sewing. This usually happens when you are sewing along the stretch’s direction like on a t-shirt’s hem. When you use a walking foot, the knit fabrics move evenly and don’t stretch out. When you use a walking foot for sewing with stretch fabrics, you will see a considerable difference. Especially when you are using a sewing machine like Janome MC14000 that comes with two different walking feet (one regular and one narrow walking foot). The Janome Memory Craft 14000 sews stretch fabrics very beautifully with its two walking feet. Installing a walking foot to a sewing machine is easy. Simply lift the presser foot of the machine without moving the needle up to its highest position. Then, remove the regular presser foot and presser foot holder from your sewing machine. You must screw the whole foot off, not only the snap-on part. Now to attach the walking foot to the sewing machine, slide it from behind and put the clamp around presser foot holder screw of the machine in the left while making sure that the walking foot’s plastic fork sits perfectly around the needle bar on the right side. Now, tighten the screw. Move the needle down and up again to test if the walking foot fits perfectly and doesn’t touch the sole’s metal. You will see the little fork and level move along and this is what controls the upper feed dogs. You may be unsure about how to use a walking foot sewing machine if you haven’t worked with a walking foot attachment before. Sewing with the walking foot is a straightforward process. Once you have attached one to a sewing machine, you just sew as you would normally do with a regular presser foot. Make sure that your work is basted or pinned before starting. Insert the fabric, lower the machine’s presser foot, and start sewing. To keep the fabric nice and flat, put both your hands on fabric at either the right side or left side of the sewing needle. If you want to keep your hold on the fabric more stable, get yourself a pair of quilting gloves. Once you are done, simply put the needle in a down position, lift the machine’s presser foot, and rotate it so that it is facing the right way for the next run of stitching. When you have to continue again, you can just lower the regular presser foot and start sewing. When you are creating a unique pattern of several same or different lines, you can use the walking foot’s edge as a spacing guide. However, if you are working with complicated patterns, you should make out all the lines before sewing. For stretch and knit fabrics, use a special needle. A walking foot attachment helps with machine quilting. Three layers make up a single quilt sandwich – the quilting backing, the inner battling,and the quilt top. These are bulky layers that can shift quite easily when you are sewing them together using a standard presser foot. A walking foot attachment prevents the bulky layers from shifting and helps you get good results. You will find a walking foot extremely useful when you are working with bulkier layers like that of a denim quilt or rag quilt. Walking foot is fairly large so it is difficult to navigate in and around corners. This foot is best for straight-line quilting like quilting gently curved lines. For tight curves and intricate designs, free-motion quilting works best. Using a walking foot, you can sew the binding to quilts. You have to deal with several layers when sewing binding around a quilt’s edges. A walking foot helps keep the layers from shifting as you sew. Some walking feet don’t have marks for judging the distance. So, you should mark the places on the fabrics where you have to stop sewing. Stopping at the right distance is crucial to your overall project. A walking foot is great for matching stripes, plaids or other patterned fabric. Once you have pinned the fabric together correctly, you can use this special foot to ensure that the patterned fabrics don’t shift out of place while you are sewing. Not all sewing machines come with the walking foot accessory. You may find it as an accessory in some sewing machines. If your machine doesn’t have it, you may have to purchase this foot as an additional accessory. You should get a walking foot if your work involves quilting. Otherwise, you can settle for the regular presser foot. If you want to buy a walking foot, look for generic versions of this special foot that work fine with many models of sewing machines. You can search online for a walking foot that’ll fit your specific sewing machine. Walking feet vary in price but are more expensive than most of the other sewing machines presser feet. You will find that the price paid for a walking foot is a valuable investment. It will help improve your accuracy, make sewing easier for you, and reduce the time it takes you to complete complicated projects. A walking foot is a great accessory that can improve your quilting work. 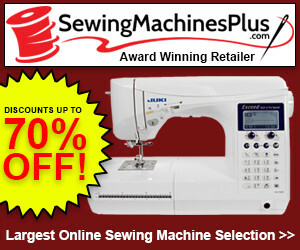 Whenever you are looking to buy a new sewing machine, you should look for a walking foot sewing machine. This means you should find a sewing machine that comes with a walking foot as an additional accessory. If your sewing machine doesn’t have a walking foot, you will find it hard to find one after the purchase. You will have to search for a walking foot that perfectly fits your machine. Therefore, it is best to buy a walking foot sewing machine. We have provided some examples of quilting work where using a walking foot is a good option. We have also shown how you can install and use a walking foot with your sewing machine. So, you won’t have any problem working with a walking foot on your next. Why don’t you give this unique foot a try in your next quilting work? We are sure you will love the experience of using a walking foot and you will see great results from this accessory.